Follow us on Twitter @scrumdotorg and read more from our community of experts on the Scrum.org blog. Ken Schwaber initially attempted to develop Scrum.org’s programs elsewhere, but ultimately, he found that to accomplish his goal of improving Scrum knowledge, training, and implementations, he would need to break away and start Scrum.org. “Why did you found Scrum.org?" I’ve been asked these questions countless times since I created Scrum.org last fall. This is the story of my journey with Scrum, starting with its creation, moving through the establishment and evolution and ending with my work with Scrum.org. This journey has been shaped by two opposing forces: the desire to do the right thing, and the desire to make money. I formed Scrum.org to refocus my efforts on doing the right thing. The story of Scrum’s beginnings is well-known, so I won’t spend much time on it here. Jeff Sutherland and I had been using Scrum for ten years prior to the meeting at Snowbird where we and others signed the Agile Manifesto. This manifesto, along with my first book about Scrum (“Agile Software Development with Scrum”) and the emergence of modern integrated development environments (IDEs), helped Scrum spread like wildfire in the early 2000s. A few years later, Martin Fowler and I were flying back to Boston from a conference about scaling Agile projects at the University of Calgary. We were dismayed that so many of our customers hadn’t understood what Agile and Scrum were about. Martin and I decided that some type of instruction and even certification would be necessary to remedy the situation. I went on to develop a two-day ScrumMaster course, the first of which was conducted at ObjectMentor in Chicago in 2002. I certified the attendees as just that – attendees – and listed their names on my website, controlchaos.com. I conducted many of these training sessions during 2002 and 2003. The course became more refined and experience-based. It began to distinguish between what Scrum is and how Scrum should be used. I considered the class a success because in my consulting work I could see how much better class attendees were able to use Scrum. I received great feedback from course attendees, and as word spread the courses became extremely popular. By early 2009, more organizations were using Agile processes than waterfall processes, and of those employing Agile 84% were using Scrum. However, less than 50% of those using Scrum were developing in incremental iterations, which are the heartbeat of Scrum. Martin Fowler wrote in his blog that he was encountering many instances of "Flaccid Scrum." Teams were using Scrum vocabulary but weren’t able to create a potentially shippable increment of functionality within a single Sprint. Creating the “Scrum Developer” program. One of the biggest challenges of using Scrum has always been the steep learning curve for the developers on the Scrum team. But because Scrum is a management practice, most of the people who taught Scrum were not current developers and were ill-qualified to teach engineering practices like test-driven development or emerging architecture. I wanted to create a specific course to address Scrum developers, so I reached out to three organizations skilled in teaching others how roll up their sleeves and build software using Scrum: Accentient, Conchango, and Microsoft. We developed a course for Scrum developers targeting the .NET technology stack. Working with Microsoft gave us access to a base of solid trainers and coaches: Microsoft MVPs and Inner Circle Partners. By starting with Microsoft we were also able to begin with a fully integrated technology stack. Once we had launched this course in spring 2010 alongside Visual Studio 2010, we would work with other partners to develop similar courses targeting other technology stacks. Formalizing the Scrum body of knowledge and measuring understanding thereof. As Scrum spread, so did confusion and misunderstanding of Scrum. Jeff Sutherland and I compiled the Scrum body of knowledge (a.k.a. the Scrum Guide) from previous works. Improving the quality and consistency of the training. I had discovered that some of the “flaccid Scrum” phenomenon was due to inconsistent training. They had different ideas about Scrum fundamentals: They all defined “done” differently, and many couldn’t answer questions about team and development dynamics during the Sprint. I wanted to improve and stabilize the training materials they were using and the training they were delivering and also create more transparency into the results that they were producing. I launched a program to upgrade and improve the consistency of their courseware, to have course attendees formally evaluate their trainers, and to require a formal assessment prior to certification to help students measure their level of understanding. I would create a new organization, Scrum.org, to continue developing and sustaining the Scrum Developer program. The program would lead to assessments and certifications based on a body of knowledge. I would also redevelop a new, more advanced version of the Scrum courseware. This courseware, called Scrum-In-Depth, would focus on how to use Scrum in advanced circumstances.I would publish the Scrum body of knowledge on Scrum.org, and formulate beginner, intermediate, and advanced assessments and certifications based on this body of knowledge. 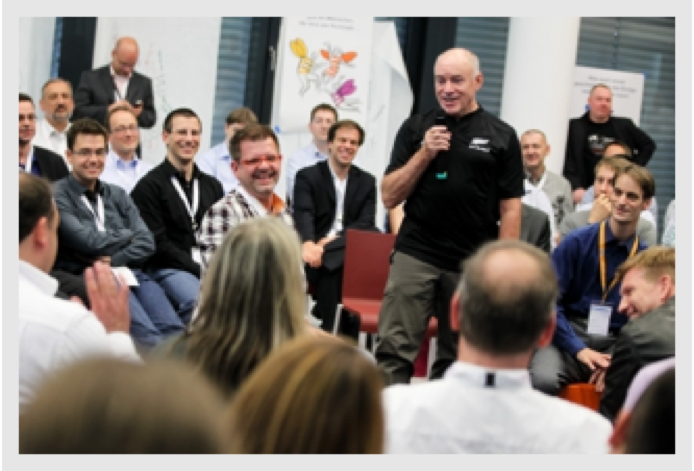 I would form a new group of Scrum Trainers who welcomed openness and transparency.